In this tutorial, I'll show you how to make a Kindle cover out of a book. It has a fabric interior, straps for holding your kindle fire in place, and a pocket for storage. 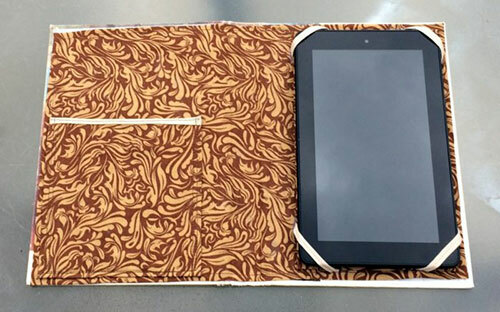 You can easily create a sturdy and stylish Kindle cover! Kindles vary slightly in size from one version to the next, and the size of the book you use will also vary, so I'm not going to give you exact measurements. Use your Kindle and your book as templates to cut the fabric to the right size. You'll need three pieces of fabric: 1) something to cover the interior of your book, 2) a piece to hold your Kindle, and 3) a piece for a pocket. You can see all of these pieces below, held down with pattern weights before they're ironed. 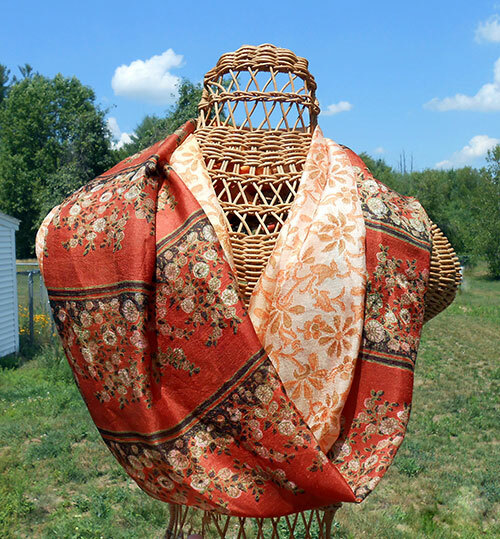 I was able to cut all of these pieces from a single fat quarter, but if you have a larger Kindle or you're using a larger book, you may need a little more fabric. As you can see below, I've also cut out four small pieces of bias tape--these will go over the corners of your Kindle to hold it in place. The longer piece of bias tape is for the top of the pocket. Sew around the edges of your Kindle holder to conceal the raw edges. Sew your strips of bias tape down the middle to hold them together. Then pin your strips of bias tape to each corner as shown. Test it out to see if it will hold your Kindle securely. Once you're happy with the placement of your strips of bias tape, sew them down. This can be a little awkward to do on a sewing machine, so if need be, you can hand-sew them. Take your larger piece of fabric and your pocket, and sew around the edges of each to hide the raw edges. Add a strip of bias tape to the top of your pocket, just for a little added reinforcement. Place your pocket and Kindle holder on the larger piece of fabric, and sew them in place. Be sure not to sew over the bias tape on the front of the Kindle holder. Sew up to the edge of each piece of bias tape, back tack to secure your thread, and cut your thread. Sew each corner separately, again securing your thread at the beginning and end of your stitching. Stop and start each time you hit a piece of bias tape. It should look like this when you're done. Now that you've finished the fabric portion of your Kindle cover, let's work on the book portion. Find a book that you don't mind destroying. I got this one at a library book sale for a few cents, so it wasn't in high demand. Cut out the pages--usually you can see where to cut at the front and the back of the book to remove the pages because there's fibrous material holding the pages to the spine of the book. I added duct tape to the spine of my book to reinforce it. Then I used the hot glue gun to attach the fabric to the book cover, but you could also use the book adhesive I linked to at the beginning of the post. If I did this again, I would use the book adhesive because the hot glue gun left a few lumps and bumps in the fabric. Enjoy using your new Kindle cover!